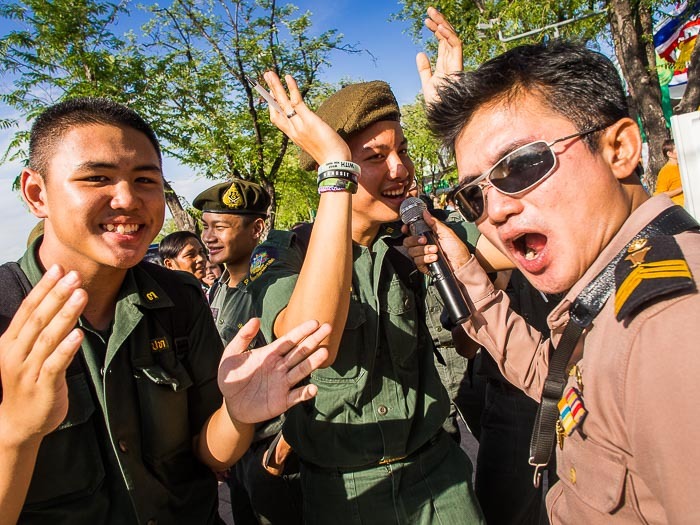 Thai military students and a sailor participate in a sing-a-long during the party to restore happiness to the Thai people on Sanam Luang. It's party time in Bangkok. 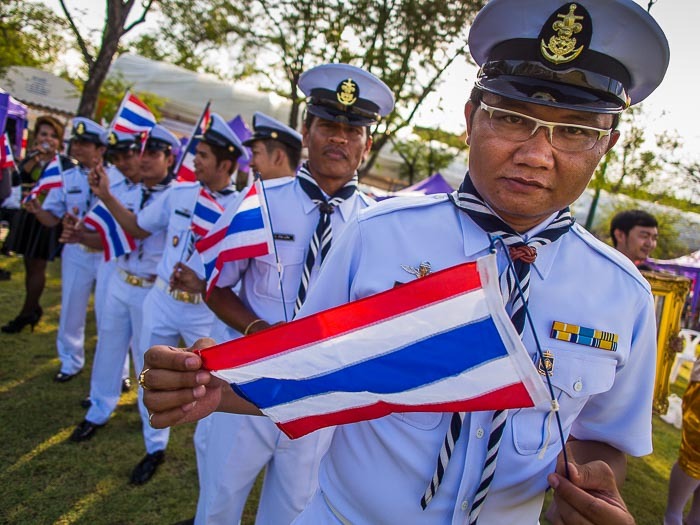 On the two month anniversary of the coup that overthrew the elected government, the ruling junta is throwing a series of parties meant to Win Hearts and Minds and restore happiness to the Thai people. Pictures with a military mascot. 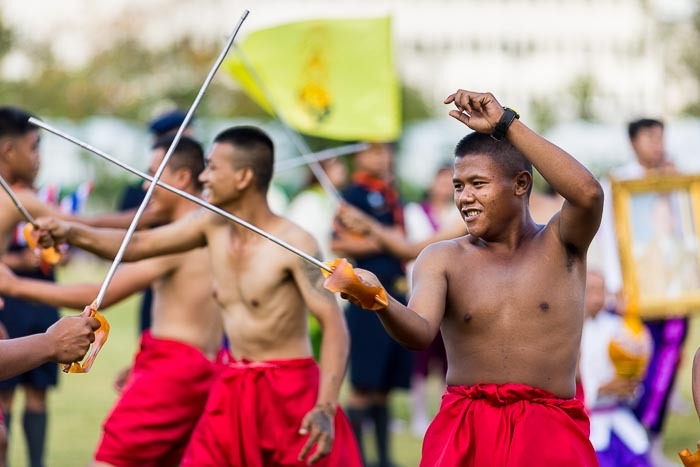 There were several "happiness" parties in Bangkok in the weeks after the coup and as the two month anniversary approached the NCPO announced plans for more parties this week. There were parties in the provinces but the big party was at Sanam Luang. Historic reenactors engage in some friendly sword play before their show. 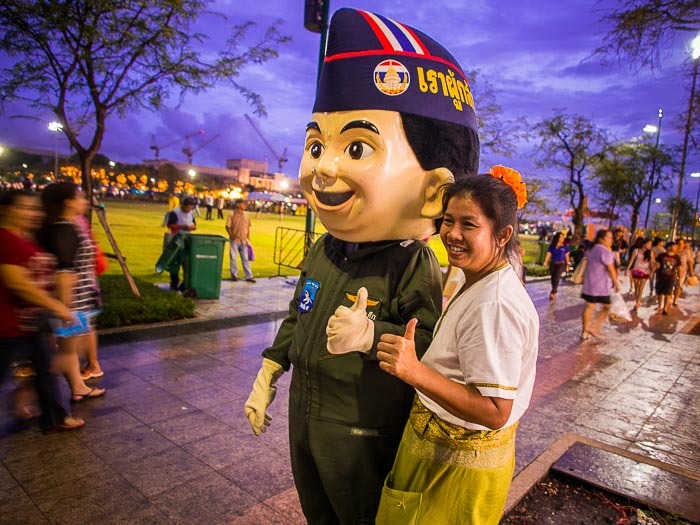 The party on Sanam Luang featured food from all corners of Thailand, music acts, free haircuts, historic pageants and movies. There was a sort of state fair atmosphere (without the midway rides) right down to the food, most of which was available on a stick. There were health checks from civilian and military medical organizations and government ministries set up tents and booths to do citizen outreach. Men line up for a patriotic parade. It seemed like the entertainment was carefully vetted. The junta made arrangements to show the King Naresuan 5, the fifth movie in an ongoing series of historic epics about King Naresuan, King of the Ayutthaya kingdom from 1590 until his death in 1605. He is one of the most revered kings in Thai history and credited with saving Thailand (then Siam) from Burmese conquest in the 1500s. A kite vendor sells a kite to a child. There are more happiness events scheduled through the weekend. Today the party moves from Sanam Luang up the road a bit to Ratchaprasong, where the Tourism Authority of Thailand has planned a happiness event of its own. 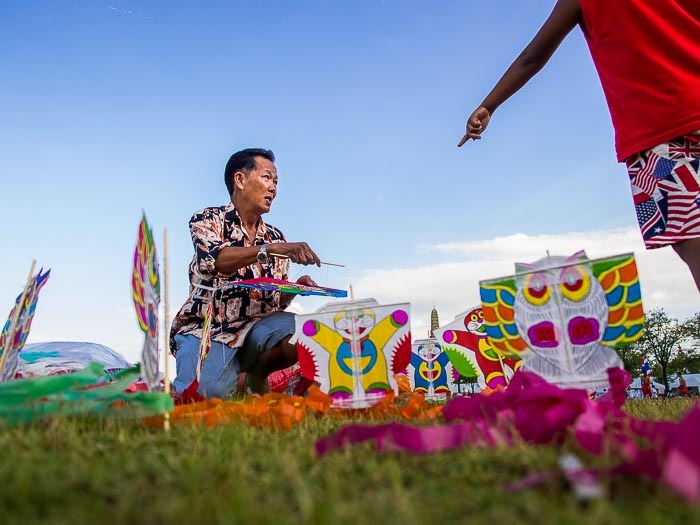 Tourism Authority of Thailand Governor Mr. Thawatchai Arunyik said, “This event will be unmatched in the annals of Thai tourism," and went on to call it the "mother of all bounce back parties." There will be a "Happiness Activity" (free ice cream is the prize) and something called a "Happiness Surprise." With a build up like that, I feel like I pretty much have to cover today's party. There are more photos from Thursday's Happiness Party in my archive or available from ZUMA Press.